I write this article as a placeholder to send people to – and as a request for information. Earth is a grey body, because it has volume, a black body does not have volume, simply that is the end of “the controversy”. I have seen similar inaccurate comments before but can’t fathom where they came from. 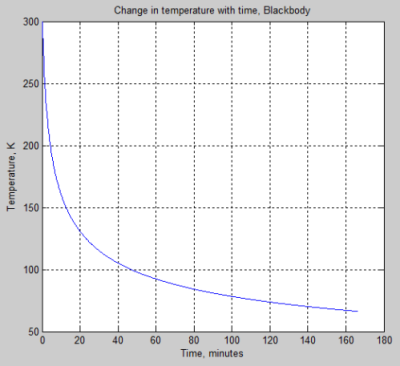 I will post examples of changing temperature for a blackbody and a non-blackbody. But because of my lack of understanding of “the problem” I have no idea if these examples will highlight particular areas of disagreement, or are completely accepted by all. 1. A blackbody has an emissivity of 1. So energy radiated in W/m², E = εσT^4, where ε=1. 2. 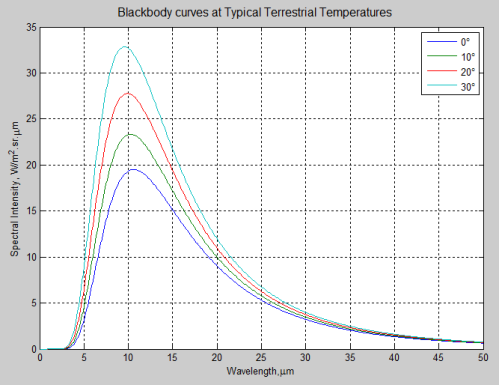 A non-blackbody has an emissivity >0 and <1. So energy radiated in W/m², E = εσT^4, where ε<1. No other physical properties are related to this parameter called emissivity, or to the difference between “blackbodies” and “non-blackbodies“. I could go on, but I’m sure the point is made. So, onto the two examples. Let’s consider a body of mass, m = 1kg with specific heat capacity, cp = 1000 J/kg.K. Therefore, heat capacity, C = 1000 J/K. Surface area, A = 2 m². 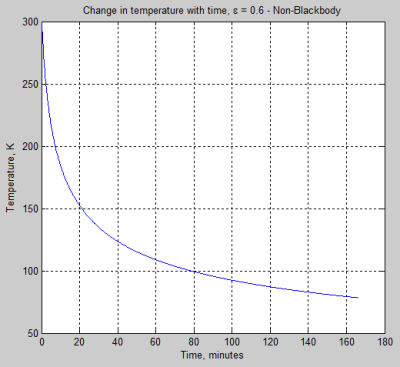 Emissivity, ε = 1 (a blackbody). No external energy is supplied after time, t=0. The body is suddenly placed in the vastness of space. What happens to temperature over time? Exactly the same as Example 1 – but ε = 0.6 (not a blackbody). You can see the form of the result is similar but the temperature drops more slowly – because it is emitting radiation more slowly. The equations are the same for both examples. The other physical parameters are the same for both. The results are similar. There is nothing startlingly different about a solution with a blackbody and a body with an emissivity less than 1. Well, that’s my take on it. Blackbodies appear to be believed to have characteristics unknown in textbooks. I hope some people can explain their “issue” with blackbodies. Or what “the problem” really is. Note 1: Yes, the background temperature of space is 2.7K, but using 0K just makes the maths easier for people to follow. A long time ago I wrote the article The Dull Case of Emissivity and Average Temperatures and expected that would be the end of the interest in emissivity. But it is a gift that keeps on giving, with various people concerned that no one has really been interested in measuring surface emissivity properly. More about this formula and background on the material properties in Planck, Stefan-Boltzmann, Kirchhoff and LTE. The parameter called emissivity is the focus of this article. It is of special interest because to calculate the radiation from the earth’s surface we need to know only temperature and emissivity. Emissivity is a value between 0 and 1. And is also depends on the wavelength of radiation (and in some surfaces like metals, also the direction). Because the wavelengths of radiation depend on temperature, emissivity also depends on temperature. 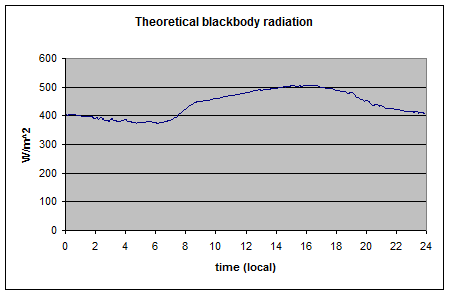 When emissivity = 1, the body is called a “blackbody”. It’s just the theoretical maximum that can be radiated. Some surfaces are very close to a blackbody and others are a long way off. Note: I have seen many articles by keen budding science writers who have some strange ideas about “blackbodies”. The only difference between a blackbody and a non-blackbody is that the emissivity of a blackbody = 1, and the emissivity of a non-blackbody is less than 1. That’s it. Nothing else. The wavelength dependence of emissivity is very important. If we take snow for example, it is highly reflective to solar (shortwave) radiation with as much as 80% of solar radiation being reflected. Solar radiation is centered around a wavelength of 0.5μm. Yet snow is highly absorbing to terrestrial (longwave) radiation, which is centered around a wavelength of 10μm. The absorptivity and emissivity around freezing point is 0.99 – meaning that only 1% of incident longwave radiation would be reflected. The emissivity (as a function of wavelength) simply modifies these curves. Suppose, for example, that the emissivity of a surface was 0.99 across this entire wavelength range. In that case, a surface at 30°C would radiate like the light blue curve but at 99% of the values shown. If the emissivity varies across the wavelength range then you simply multiply the emissivity by the intensity at each wavelength to get the expected radiation. Sometimes emissivity is quoted as an average for a given temperature – this takes into account the shape of the Planck curve shown in the graphs above. In practice the calculation is slightly more involved, see note 1. It turns out that the emissivity of water and of the ocean surface is an involved subject. 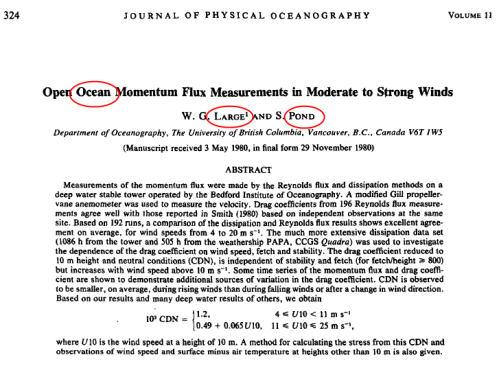 And because of the importance of calculating the sea surface temperature from satellite measurements, the emissivity of the ocean in the “atmospheric window” (8-14 μm) has been the subject of many 100’s of papers (perhaps 1000’s). These somewhat overwhelm the papers on the less important subject of “general ocean emissivity”. Aside from climate, water itself is an obvious subject of study for spectroscopy. The optical constants of water have been extensively studied because of their importance in science and technology. Applications include a) remote sensing of natural water surfaces, b) radiant energy transfer by atmospheric water droplets, and c) optical properties of diverse materials containing water, such as soils, leaves and aqueous solutions. In this study, values of the complex index of refraction from six recent articles were averaged by visual inspection of the graphs, and the most representative values in the wavelength range of 0.200 μm to 5 cm were determined. These were used to find the directional polarized reflectance and emissivity of a specular surface and the Brewster or pseudo-Brewster angle as functions of wavelength. The directional polarized reflectance and emissivity of wind-generated water waves were studied using the facet slope distribution function for a rough sea due to Cox and Munk . Applications to remote sensing of sea surface temperature and wave state are discussed, including effects of salinity. For any wavelength, the total emissivity, ε, is constant for all θ [angles] < 45° [from vertical]; this follows from Fig. 8 and Eq. (6a). It is important in remote sensing of thermal radiation from space, as discussed later.. The polarized emissivities are independent of surface roughness for θ < 25°, while for θ > 25°, the thermal radiation is partly depolarized by the roughness. 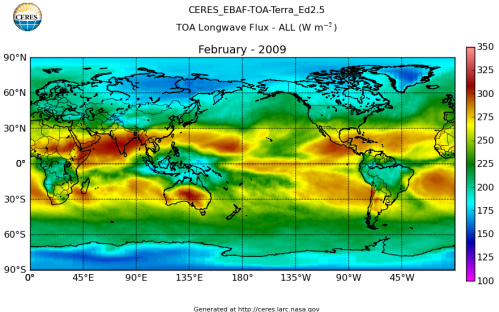 This means that when you look at the emission radiation from directly above (and close to directly above) the sea surface roughness doesn’t have an effect. The 8-14-μm spectral band is chosen for discussion here because (a) it is used in remote sensing and (b) the atmospheric transmittance, τ, in this band is a fairly well-known function of atmospheric moisture content. Water vapor is the chief radiation absorber in this band. In Eqs. (2)-(4), n and k (and therefore A and B) are functions of salinity. However, the emissivity value, ε, computed for pure water differs from that of seawater by <0.5%. When used in Eqs. (10), it causes an error of <0.20°C in retrieved Ts [surface temperature]. Since ε in this band lies between 0.96 and 0.995, approximation ε= 1 is routinely used in sea surface temperature retrieval. However, this has been shown to cause an error of -0.5 to -1.0°C for very dry atmospheres. For very moist atmospheres, the error is only ≈0.2°C. 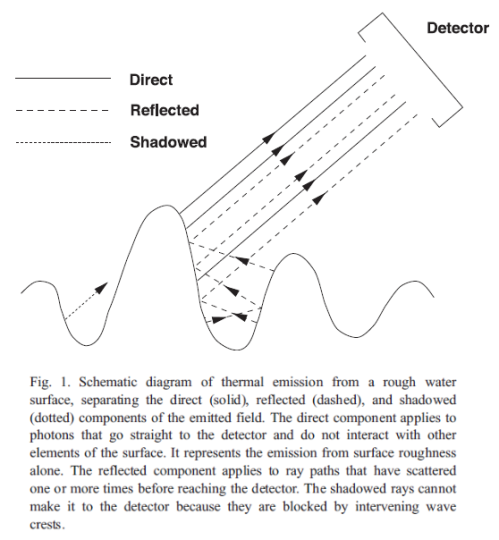 Emissivity = 1 – Reflectance. 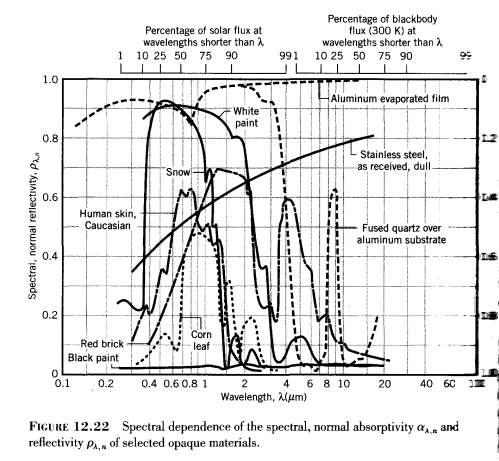 The graph shows Reflectance vs Wavelength vs Angle of measurement. The “unofficial” result, calculating the average emissivity from the ratio: ε = 0.96. This result is valid for 0-30°C. But I suspect the actual value will be modified slightly by the solid angle calculations. That is, the total flux from the surface (the Stefan-Boltzmann equation) is the spectral intensity integrated over all wavelengths, and integrated over all solid angles. So the reduced emissivity closer to the horizon will affect this measurement. In this paper, sea surface emissivity (SSE) measurements obtained from thermal infrared radiance data are presented. These measurements were carried out from a fixed oilrig under open sea conditions in the Mediterranean Sea during the WInd and Salinity Experiment 2000 (WISE 2000). 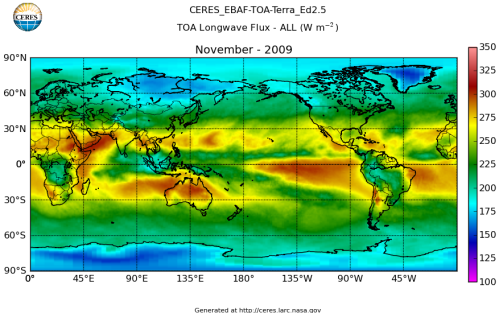 The SSE retrieval methodology uses quasi-simultaneous measurements of the radiance coming from the sea surface and the downwelling sky radiance, in addition to the sea surface temperature (SST). 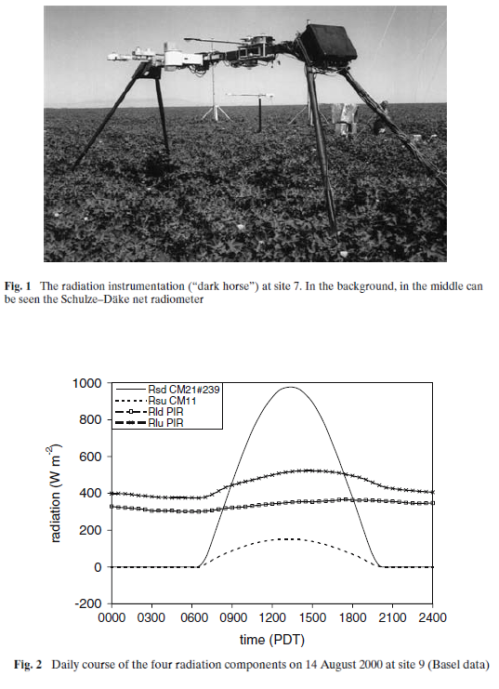 The radiometric data were acquired by a CIMEL ELECTRONIQUE CE 312 radiometer, with four channels placed in the 8–14 μm region. The sea temperature was measured with high-precision thermal probes located on oceanographic buoys, which is not exactly equal to the required SST. 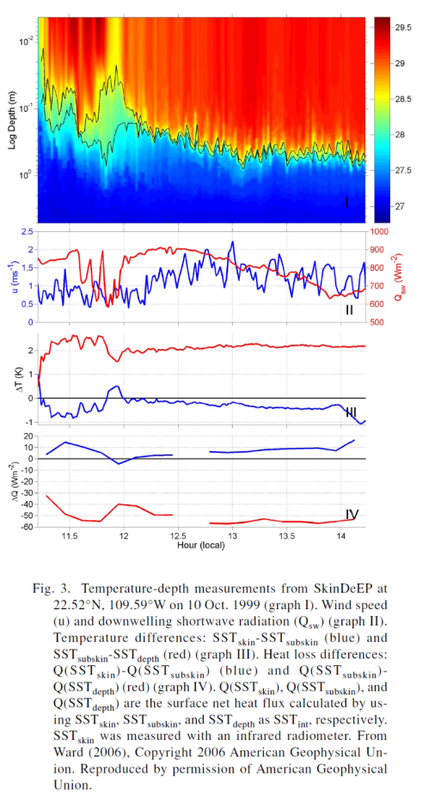 A study of the skin effect during the radiometric measurements used in this work showed that a constant bulk–skin temperature difference of 0.05±0.06 K was present for wind speeds larger than 5 m/s. Our study is limited to these conditions. Thus, SST used as a reference for SSE retrieval was obtained as the temperature measured by the contact thermometers placed on the buoys at 20-cm depth minus this bulk–skin temperature difference. SSE was obtained under several observation angles and surface wind speed conditions, allowing us to study both the angular and the sea surface roughness dependence. Our results were compared with SSE models.. The requirement of a maximum uncertainty of ±0.3 K in sea surface temperature (SST) as input to climate models and the use of high observation angles in the current space missions, such as the 55° for the forward view of the Advanced Along Track Scanning Radiometer (AATSR) (Llewellyn-Jones et al., 2001) on board ENVISAT, need a precise and reliable determination of sea surface emissivity (SSE) in the thermal infrared region (TIR), as well as analyses of its angular and spectral dependences. The emission of a rough sea surface has been studied over the last years due to the importance of the SSE for accurate SST retrieval. A reference work for many subsequent studies has been the paper written by Cox and Munk (1954).. This paper also goes on to compare the results with the model of Wu & Smith (1997) and indicates the Wu & Smith’s model is a little better. Note that the emissivities are in the 8-14μm range. You can see that the emissivity when measured from close to vertical is 0.98 – 0.99 at two different wind speeds. 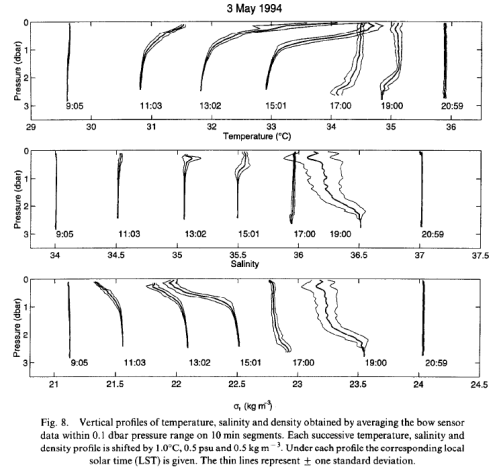 A slightly older paper which is not concerned with angular dependence of sea surface emissivity is by Konda, Imasato, Nishi and Toda (1994). 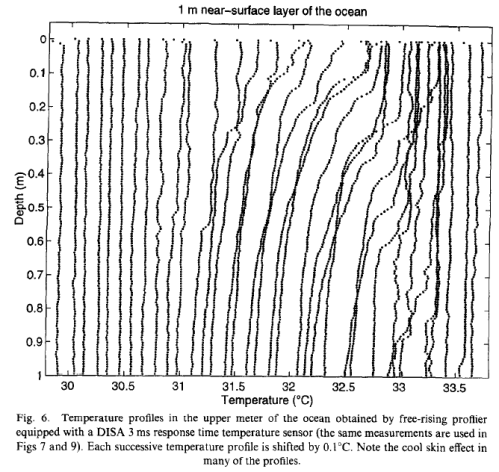 Buettner and Kern (1965) estimated the sea surface emissivity to be 0.993 from an experiment using an emissivity box, but they disregarded the temperature difference across the cool skin. 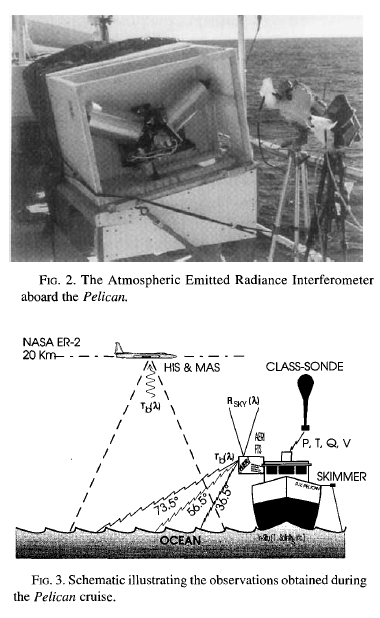 Saunders (1967b, 1968) observed the plane sea surface irradiance from an airplane and determined the reflectance. By determining the reflectance as the ratio of the differences in energy between the clear and the cloudy sky at different places, he calculated the emissivity to be 0.986. The process of separating the reflection from the surface irradiance, however, is not precise. 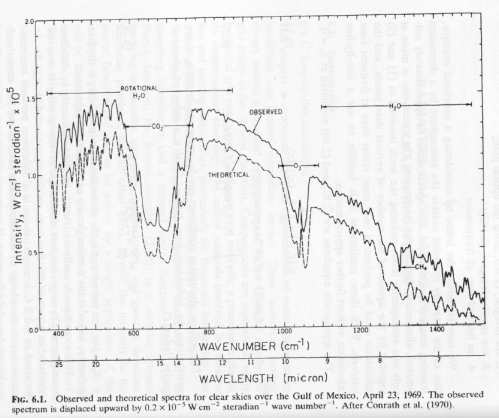 Mikhaylov and Zolotarev (1970) calculated the emissivity from the optical constant of the water and found the average in the infrared region was 0.9875. The observation of Davies et al. (1971) was performed on Lake Ontario with a wave height less than 25 cm. They measured the surface emission isolated from sky radiation by an aluminum cone, and estimated the emissivity to be 0.972. The aluminum was assumed to act as a mirror in infrared region. In fact,aluminum does not work as a perfect mirror. Masuda et al. 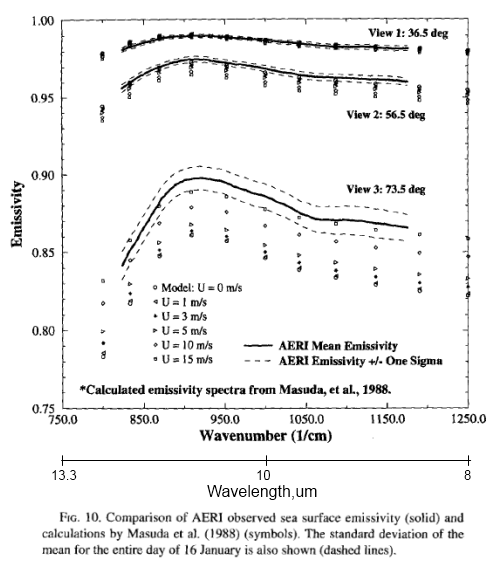 (1988) computed the surface emissivity as a function of the zenith angle of observed radiation and wind speed. They computed the emissivity from the reflectance of a model sea surface consisting of many facets, and changed their slopes according to Gaussian distribution with respect to surface wind. The computed emissivity in 11 μm was 0.992 under no wind. Each of these studies in trying to determine the value of emissivity, failed to distinguish surface emission from reflection and to evaluate the temperature difference across the cool skin. The summary of these studies are tabulated in Table 1. Konda and his co-workers took measurements over a one year period from a tower in Tanabe Bay, Japan. They calculated from their results that the ocean emissivity was 0.984±0.004. 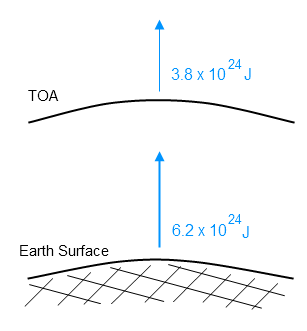 The point is the actual surface from which the radiation is emitted will usually be at a slightly different temperature from the bulk temperature (note the logarithmic scale of depth). This is the “cool skin” effect. This surface temperature effect is also moderated by winds and is very difficult to measure accurately in field conditions. An important objective in satellite remote sensing is the global determination of sea surface temperature (SST). For such measurements to be useful to global climate research, an accuracy of ±0.3K or better over a length of 100km and a timescale of days to weeks must be attained. This criterion is determined by the size of the SST anomalies (≈1K) that can cause significant disturbance to the global atmospheric circulation patterns and the anticipated size of SST perturbations resulting from global climate change. This level of uncertainty is close to the theoretical limits of the atmospheric corrections.. Note that the primary focus of this research was to have accurate SST measurements from satellites. The experimental work on the research vessel Pelican included a high spectral resolution Atmospheric Emitted Radiance Interferometer (AERI) which was configured to make spectral observations of the sea surface radiance at several view angles. Any measurement from the surface of course, is the sum of the emitted radiance from the surface as well as the reflected sky radiance. There was also independent measurement of the radiative temperature of the sea surface at 10μm with a Heimann broadband radiation thermometer “window” radiometer. And radiosondes were launched from the ship roughly every 3 hours. Additionally, various other instruments took measurements from a flight altitude of 20km. Satellite readings were also compared. The AERI measured the spectral distribution of radiance from 3.3μm to 20μm at 4 angles. Upwards at 11.5° from zenith, and downwards at 36.5°, 56.5° and 73.5°. There’s a lot of interesting discussion of the calculations in their paper. Remember that the primary aim is to enable satellite measurements to have the most accurate measurements of SST and satellites can only really “see” the surface through the “atmospheric window” from 8-12μm. 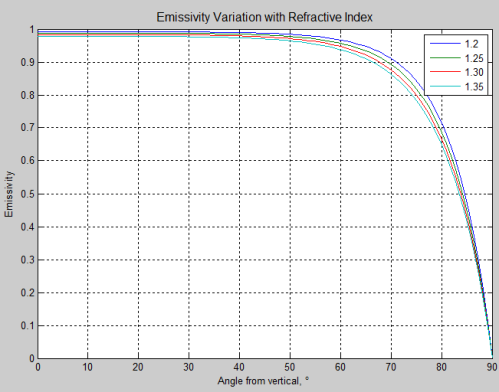 Here are the wavelength dependent emissivity results shown for the 3 viewing angles. You can see that at the lowest viewing angle of 36.5° the emissivity is 0.98 – 0.99 in the 8-12μm range. Note that the wind speed doesn’t have any effect on emissivity at the more direct angle, but as the viewing angle moves to 73.5° the emissivity has dropped and high wind speeds change the emissivity considerably. Henderson et al (2003) is one of the many papers which consider the theoretical basis of how viewing angles change the emissivity and derive a model. The legend is refractive index from 1.20 to 1.35. Water, at visible wavelengths, has a refractive index of 1.33. This shows how the emissivity reduces once the viewing angle increases above 50° from the vertical. 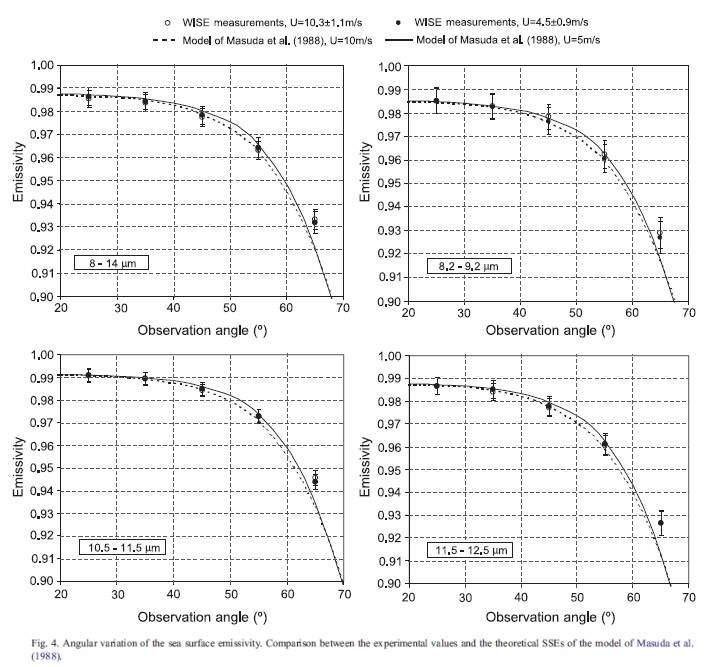 Henderson and his co-workers compare their results with the measured results of Smith et al (1996) and also comment that at zenith viewing angles the emissivity does not depend on the wind speed, but at larger angles from vertical it does. We have developed a Monte Carlo ray-tracing model to compute the emissivity of computer-rendered, wind-roughened sea surfaces. The use of a ray-tracing method allows us to include both the reflected emission and shadowing and, furthermore, permits us to examine more closely how these processes control the radiative properties of the surface. The intensity of the radiation along a given ray path is quantified using Stokes vectors, and thus, polarization is explicitly included in the calculations as well. Their model results compare well with the experimental results. 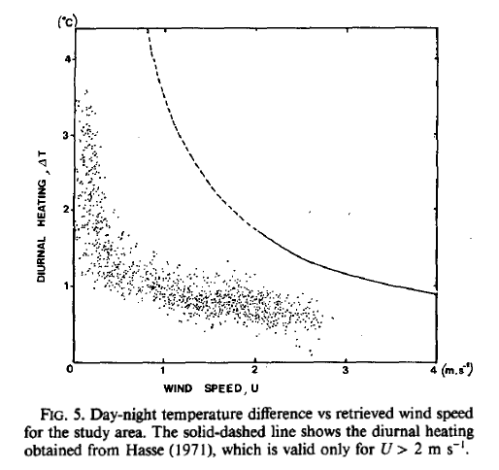 Note that the approach of generating a mathematical model to calculate how emissivity changes with wind speed and, therefore, wave shape is not at all new. Water retains its inherent properties of emissivity regardless of how it is moving or what shape it is. The theoretical challenge is handling the multiple reflections, absorptions, re-emissions that take place when the radiance from the water is measured at some angle from the vertical. The best up to date measurements of ocean emissivity in the 8-14 μm range are 0.98 – 0.99. The 8-14 μm range is well-known because of the intense focus on sea surface temperature measurements from satellite. From quite ancient data, the average emissivity of water across a very wide broadband range (1-100 μm) is 0.96 for water temperatures from 0-30°C. The values from the ocean when measured close to the vertical are independent of wind speed and sea surface roughness. As the angle of measurement moves from the vertical around to the horizon the measured emissivity drops and the wind speed affects the measurement significantly. 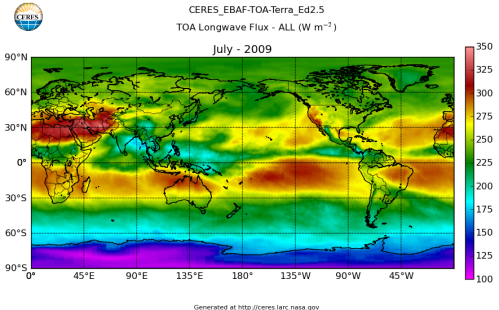 These values have been extensively researched because the calculation of sea surface temperature from satellite measurements in the 8-14μm “atmospheric window” relies on the accurate knowledge of emissivity and any factors which affect it. For climate models – I haven’t checked what values they use. I assume they use the best experimental values from the field. That’s an assumption. I’ve already read enough on ocean emissivity. For energy balance models, like the Trenberth and Kiehl update, an emissivity of 1 doesn’t really affect their calculations. The reason, stated simply, is that the upwards surface radiation and the downward atmospheric radiation are quite close in magnitude. For example, the globally annually averaged values of both are 396 W/m² (upward surface) vs 340 W/m² (downward atmospheric). Suppose the emissivity drops from 0.98 to 0.97 – what is the effect on upwards radiation through the atmosphere? The upwards radiation has dropped by 4W/m², but the reflected atmospheric radiation has increased by 3.4W/m². The net upwards radiation through the atmosphere has reduced by only 0.6 W/m². One of our commenters asked what value the IPCC uses. The answer is they don’t use a value at all because they summarize research from papers in the field. Whether they do it well or badly is a subject of much controversy, but what is most important to understand is that the IPCC does not write papers, or perform GCM model runs, or do experiments – and that is why you see almost no equations in their many 1000’s of pages of discussion on climate science. 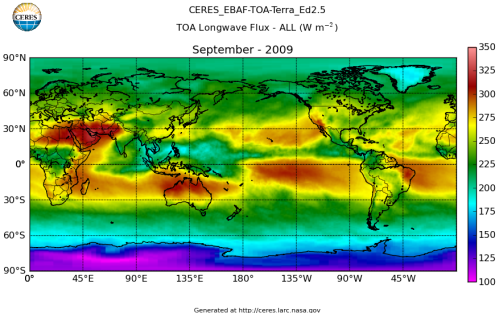 For those who don’t believe the “greenhouse” effect exists, take a look at Understanding Atmospheric Radiation and the “Greenhouse” Effect – Part One in the light of all the measured results for ocean emissivity. It’s common to find claims on various blogs and in comments on blogs that climate science doesn’t do much actual research. I haven’t found that to be true. I have found the opposite. Whenever I have gone digging for a particular subject, whether it is the diurnal temperature variation in the sea surface, diapycnal & isopycnal eddy diffusivity, ocean emissivity, or the possible direction and magnitude of water vapor feedback, I have found a huge swathe of original research, of research building on other research, of research challenging other research, and detailed accounts of experimental methods, results and comparison with theory and models. Just as an example, in the case of emissivity of sea surface, at the end of the article you can see the first 30 or so results pulled up from one journal – Remote Sensing of the Environment for the search phrase “emissivity sea surface”. The journal search engine found 348 articles (of course, not every one of them is actually about ocean emissivity measurements). Perhaps it might turn out to be the best journal for this subject, but it’s still just one journal. 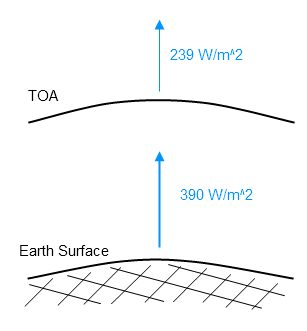 Note 1: The upward radiation from the surface is the sum of three contributions: (i) direct emission of the sea surface, which is attenuated by the absorption of the atmospheric layer between the sea surface and the instrument; (ii) reflection of the downwelling sky radiance on the sea, attenuated by the atmosphere; and (iii) the upwelling atmospheric radiance emitted in the observing direction. where the three terms on the right are each of the three contributions noted in the same order. This first part considers some elementary points. In the next part we will consider more advanced aspects of this subject. To see how we can differentiate the solar and terrestrial radiation, take a look at The Sun and Max Planck Agree – Part Two. 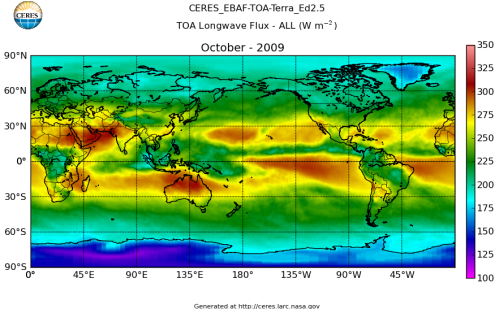 The top of atmosphere (TOA) radiation from the climate system is usually known as outgoing longwave radiation, or OLR. 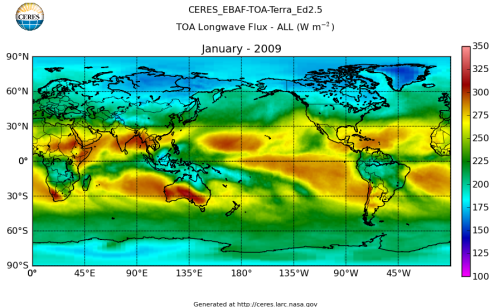 “Longwave” is a climate convention for wavelength >4μm. 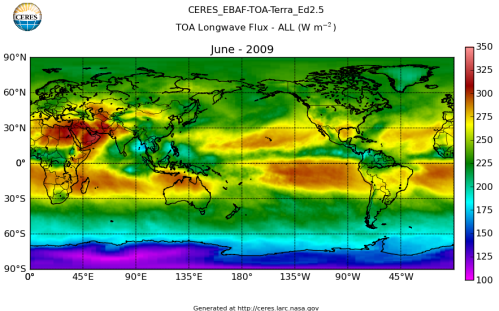 All of this data comes from CERES – Clouds and the Earth’s Radiant Energy System. You can review this data for yourself here. How accurate is the data? from Dessler et al (2007) writing about the CERES data. The reason for calculating the total energy in 2009 is because many people have realized that there is a problem with average temperatures and imagine that this problem is carried over to average radiation. Not true. We can take average radiation and convert it into total energy with no problem. What about the radiation from the surface? 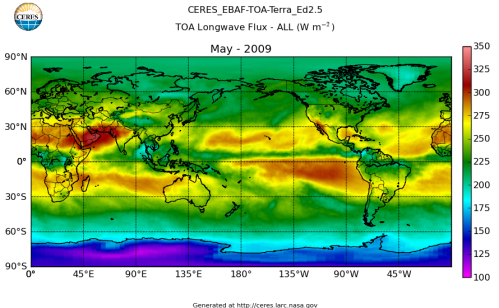 What do the satellite measurements say about surface radiation? Well strictly speaking – they say a lot, but only once certain theories of radiative transfer are embraced. 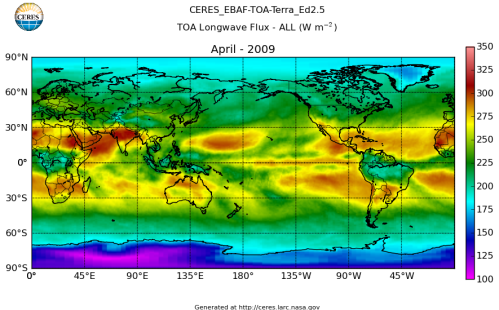 To be more accurate, what satellite measurements OF surface radiation do we have? That’s because the atmosphere interacts with the radiation emitted from the surface. So any top-of-atmosphere measurements by satellite are not “unsullied surface measurements”. There are temperature stations all around the world – not enough for some people, and not as well-located as they could be – but what about stations for measuring radiation upwards from the earth (and ocean) surface? Thin on the ground, extremely thin. This equation is called the Stefan-Boltzmann equation. More about it in Planck, Stefan-Boltzmann, Kirchhoff and LTE. It is a well-proven equation with 150 years of evidence behind it – and from all areas of engineering and physics. It is used in calculations for heat-exchangers and boilers, for example. Still, many people when they find out that the radiation from the surface of the earth is calculated not measured are very suspicious. It’s good to be skeptical. Ask questions. But don’t assume it’s made up just because it’s calculated. Why trust thermometers? They actually rely on material properties as well.. Anyway, back to the emission of radiation from the surface. What about this parameter emissivity, ε? Note that reflectivity = 1 – emissivity in the graph above. Without going into a lot of detail, all it means is that the measurement of emissivity needs to be for the appropriate temperature. See note 1. 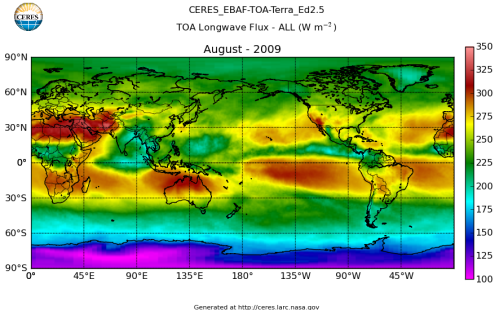 Generally the emissivity of the earth’s surface is very close to 1 (for “longwave” measurements). Oceans, which cover 71% of the earth’s surface, have an emissivity of about 0.98 – 0.99. The average temperature of the earth’s surface (including days, nights and all locations) is around 15°C (288K). Average temperature is a problematic value because radiation is not linearly dependent on temperature – it is dependent on the 4th power of temperature. 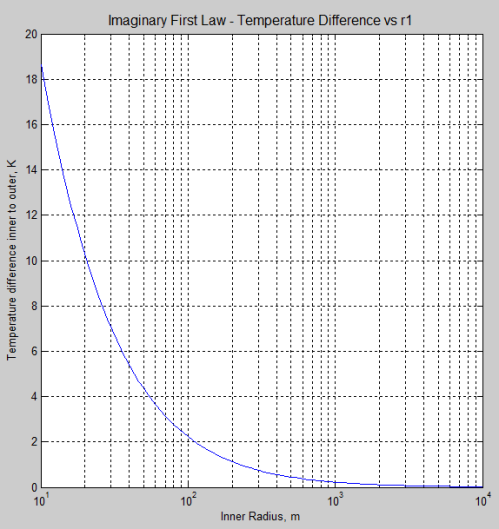 See The Dull Case of Emissivity and Average Temperatures for an example of the problems in using “average temperature”. The line with the x’s is the measured surface upward radiation. Note how it matches the measured value. You can see this in more detail in The Amazing Case of “Back Radiation” – Part Three. – is a solid theory, backed up over the last 150 years. If we calculate the average radiation from the surface, globally annually averaged, we get a value around 390 W/m². If we calculate the total surface radiation over one year, we get Esurf = 6.2 x 1024 J. As I found with previous articles, many people’s instinctive response is “you’ve made a mistake”. Usually those that just aren’t happy with this diagram solve the “dissonance” by concluding that there is something wrong with the averaging, or Stefan-Boltzmann’s law, or the measurement of emissivity around the planet. Remember that the top of atmosphere number is measured. Remember that the surface radiation is calculated, and relies on measurements of temperature, the material property called emissivity and an equation backed up by 150 years of experimental work across many fields. This effect which we see has come, inappropriately, to be called the “greenhouse” effect. We could convert the effect to a temperature but there are more important things to move onto. Before examining how this amazing effect takes place and what happens to all this energy – “Does it just pile up and eventually explode, no – so obviously you made a mistake”, and so on – I’ll leave one thought for interested students..
We have looked at the average radiation from surface and top of atmosphere (and also totaled that up). Instead, we could take a look at some individual ocean locations where the temperature is well known. We have the CERES monthly averages on a 1° x 1° grid above. Take a few ocean locations and find the average temperatures for each month. Then calculate the surface radiation using the known emissivity of 0.99. 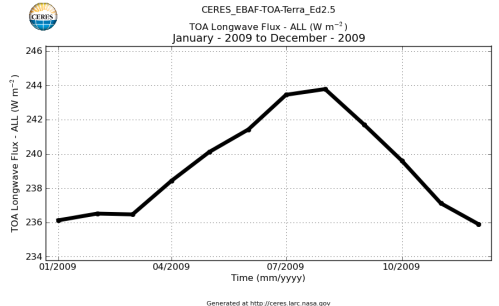 Compare that to the top of atmosphere radiation from the CERES charts at the start of the article. Also calculate what value of ocean emissivity would actually be needed for surface radiation to equal the top of atmosphere radiation (so as to make the “greenhouse” effect disappear). Please report back in the comments. The reason I chose the ocean for this exercise is because the emissivity is well known and measured so many times, because ocean surfaces don’t change temperature very much from day to night (because of the high heat capacity of water) and because oceans cover 71% of the earth’s surface. If ocean data verifies the “greenhouse” effect to you, then it’s pretty hard to find emissivity values of other surface types that would make the “greenhouse” effect disappear. Huh? Let’s choose a different heading.. If longwave radiation (remember this is the radiation emitted by the earth and climate system) was transparent to the various gases in the atmosphere the surface radiation would not change on its journey to the top of atmosphere. See The Hoover Incident for more on this and the consequences. Instead at each height in the atmosphere there is absorption of some radiation. The detail gets pretty complicated because each gas absorbs at very selective wavelengths (see note 2). 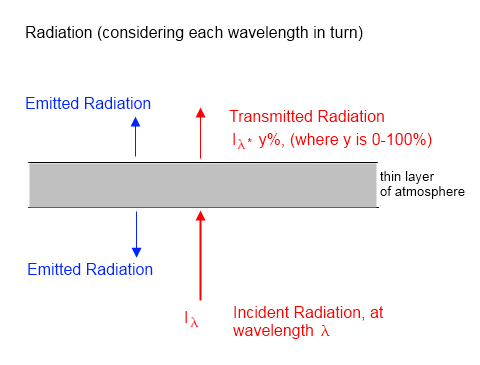 If a proportion of the upward radiation is absorbed by the atmosphere so that less radiation emerged than entered (the red text and arrows) then isn’t this a first law of thermodynamics problem? So surely, absorption of radiation with no continuous heating is a problem for the first law of thermodynamics? Of course, energy transfer can also take place via convection. So it is theoretically possible that energy could be absorbed as radiation and leave via convection. But that isn’t really possible all through the climate as convection would need to transfer energy from high up in the atmosphere to the surface, whereas in general, convection transfers energy in the other direction – from the surface to higher up in the atmosphere. So what happens and how does the first law of thermodynamics stay intact? Very simple – every layer of atmosphere also radiates energy. This is shown as blue text and arrows in the diagram. Each layer in the atmosphere does obey the first law of thermodynamics. But by the time we reach the top of atmosphere the upwards radiation has been significantly reduced – on average from 390 W/m² to 239 W/m². Each layer in the atmosphere absorbs radiation from below (and above). The gases that absorb the energy share this energy via collisions with other gases (thermalization), so that all of the different gases are at the same temperature. And the radiately-active gases (like water vapor and CO2) then radiate energy in all directions. This last point is the key point. If the radiation was (somehow magically) only upwards then the “greenhouse” effect would not occur. Digression – Up & Down or All Around? Doesn’t it radiate in all directions? Looks like another climate science over-simplication.. This is a good point. Radiation from the atmosphere does go in all directions not just up and down. 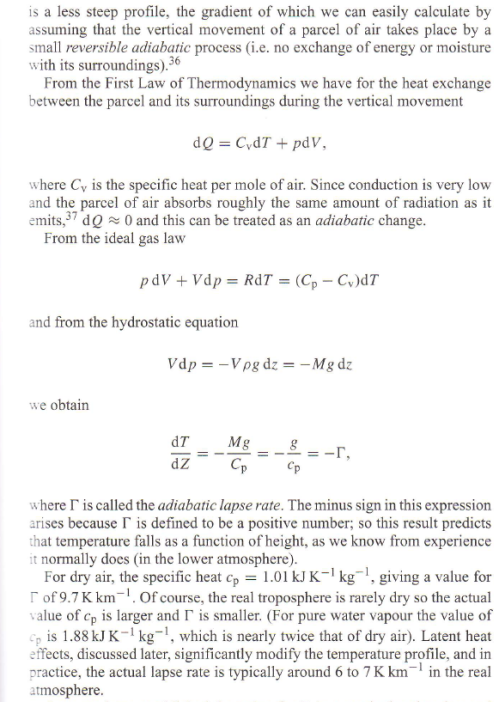 In the radiative transfer equations this is taken into account. The simplified explanation just makes for an easier to understand point for beginners. See Vanishing Nets under Diffusivity Approximation for more about the calculation. Note the reversal of the x-axis direction. 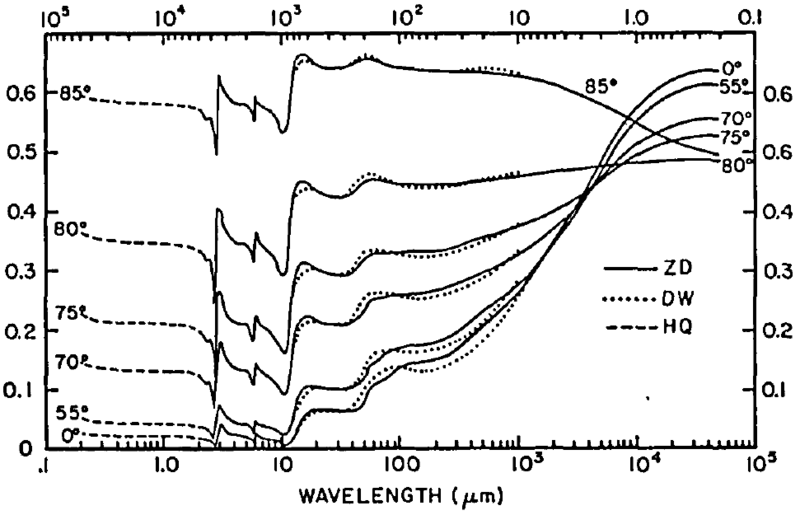 The “missing bits” in the curve are the wavelengths where the radiatively active gases have absorbed and re-radiated. Some of the radiation is downward, which explains where the “missing radiation” goes. At the surface we can measure this downward radiation from the atmosphere. See The Amazing Case of “Back Radiation” -Part One and the following two parts for more discussion of this. Or – the difference between energy in and energy out results in increasing or decreasing temperature. If you like, think of the atmosphere as a partial mirror reflecting a proportion of the radiation at a number of layers up through the atmosphere. It’s a mental picture that might help even though what actually happens is somewhat different. See also Do Trenberth and Kiehl understand the First Law of Thermodynamics? Part Three – The Creation of Energy? No explanation of radiation would be complete without people saying that this argument is falsified by the fact that convection hasn’t been discussed. Just to forestall that: Convection moves heat from the surface up into the atmosphere very effectively and cools the surface compared with the case if convection didn’t occur. But – emission and absorption of radiation still takes place. Convection doesn’t change the absorption of radiation (unless it changes the concentration of various gases). But convection, by changing the temperature profile, does change emission. As we will see in Part Two, absorption is a function of concentration of each gas; while emission is a function of concentration of each gas plus the temperature of that portion of the atmosphere. The atmosphere interacts with the radiation from the surface and that’s why the surface radiation has been reduced by the time it leaves the climate system. The satellites measure the value at the top of atmosphere very comprehensively. For those convinced that there is no “greenhouse” effect, I recommend focusing on the emissivity measurements used in the calculation of emission from the surface. The ocean has been measured at 0.98-0.99 and covers 71% of the surface of the earth but perhaps the average surface emissivity at terrestrial temperatures is only 0.61.. A measurement snafu.. In the next part we will consider in more detail how the different effects cause changes in the OLR. 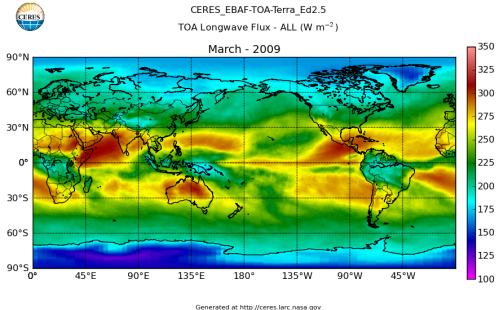 An analysis of the dependence of clear-sky top-of-atmosphere outgoing longwave radiation on atmospheric temperature and water vapor, Dessler et al, Journal of Geophysical Research (2008). Note 1: Radiation from a surface at 15°C (288K) will have a peak radiation at 10μm with radiation following the Planck curve. 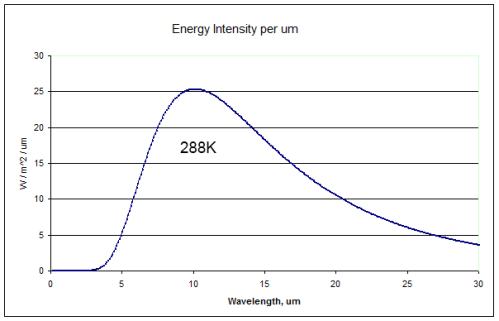 The average emissivity for 288K needs to be the wavelength-dependent emissivity weighted appropriately for the corresponding Planck curve. This will be very similar for the emissivity for the same surface type at 300K or 270K but is likely be totally different for the emissivity for the surface at 3000K – not a situation we find on earth. I recently came across Azimuth – a fascinating blog by John Baez. What prompted me to actually get around to writing a brief article was the latest article – This Week’s Finds (Week 307) – about El Nino and its uncertain causes and comes with great graphics and interesting explanations. I finally broke that mental block when I read some stuff on William Kessler‘s website. He’s an expert on the El Niño phenomenon who works at the Pacific Marine Environmental Laboratory. One thing I like about his explanations is that he says what we do know about the El Niño, and also what we don’t know. We don’t know what triggers it! We understand lots of details but the big picture remains mysterious. And I enjoyed your interview with Tim Palmer because it brought out a lot of the sources of uncertainty in present-generation climate modeling. However, with El Niño, the mystery is beyond Tim’s discussion of the difficulties of climate modeling. We do not know whether the tropical climate system on El Niño timescales is stable (in which case El Niño needs an external trigger, of which there are many candidates) or unstable. In the 80s and 90s we developed simple “toy” models that convinced the community that the system was unstable and El Niño could be expected to arise naturally within the tropical climate system. Now that is in doubt, and we are faced with a fundamental uncertainty about the very nature of the beast. Since none of us old farts has any new ideas (I just came back from a conference that reviewed this stuff), this is a fruitful field for a smart young person. So, I hope some smart young person reads this and dives into working on El Niño! About 10,800 BC, something dramatic happened. The last glacial period seemed to be ending quite nicely, things had warmed up a lot — but then, suddenly, the temperature in Europe dropped about 7 °C! In Greenland, it dropped about twice that much. In England it got so cold that glaciers started forming! In the Netherlands, in winter, temperatures regularly fell below -20 °C. Throughout much of Europe trees retreated, replaced by alpine landscapes, and tundra. The climate was affected as far as Syria, where drought punished the ancient settlement of Abu Hurerya. But it doesn’t seem to have been a world-wide event. This cold spell lasted for about 1300 years. And then, just as suddenly as it began, it ended! Around 9,500 BC, the temperature in Europe bounced back. This episode is called the Younger Dryas, after a certain wildflower that enjoys cold weather, whose pollen is common in this period. I’m sure everyone who is fascinated by climate science will benefit from reading Azimuth. With apologies to my many readers who understand the basics of heat transfer in the atmosphere and really want to hear more about feedback, uncertainty, real science..
Clearing up basic misconceptions is also necessary. It turns out that many people read this blog and comment on it elsewhere and a common claim about climate science generally (and about this site) is that climate science (and this site) doesn’t understand/ignores convection. Suppose – for a minute – that convection was a totally misunderstood subject. Suppose basic results from convective heat transfer were ridiculed and many dodgy papers were written that claimed that convection moved 1/10 of the heat from the surface or 100x the heat from the surface. Suppose as well that everyone was pretty much “on the money” on radiation because it was taught from kindergarten up. It would be a strange world – although no stranger than the one we live in where many champions of convection decry the sad state of climate science because it ignores convection, and anyway doesn’t understand radiation.. In this strange world, people like myself would open up shop writing about convection, picking up on misconceptions from readers and other blogs, and generally trying to explain what convection was all about. No doubt, in that strange world, commenters and bloggers would decry the resulting over-emphasis on convection.. In more general heat transfer this last one is often included within convection, which is the movement of heat by mass transfer. Although sometimes in general heat transfer, heat transfer via “phase change” of a substance is separately treated – it’s not important where “the lines are drawn”. Latent heat being the movement of heat via evaporation – convection – condensation. Sensible heat being the movement of heat via convection with no phase change. Conduction is actually also included in sensible heat, but is negligible in atmospheric physics. Therefore when convection is written about it is both sensible and latent heat. That is, heat transfer in the atmosphere is via either convection or via radiation. Let’s look at conduction, safe from criticism because it is largely irrelevant as a form of heat transfer within the atmosphere. Conduction is also the easiest to understand and closest to people’s everyday knowledge. where ΔT is the temperature difference, Δx is the thickness of the material, A is the area, k is the conductivity (the property of the material) and q is the heat flow. (See Heat Transfer Basics – Part Zero for more on this subject). Where are the convective and the radiative terms? Interestingly, conduction is independent of convection and radiation. This is a very important point to understand – but it is also easy to misunderstand if you aren’t used to this concept. It doesn’t mean that we can calculate a change in equilibrium condition – or a dynamic result – only using one mechanism of heat transfer. Let’s suppose we have a problem where we know the temperature at time = 0 for two surfaces. We know the heating conditions at both surfaces (for example, zero heat input). We want to know how the temperature changes with time, and we want to know the final equilibrium condition. The way this problem is solved is usually numerical. This means that we have to work out the heat flow from each mechanism (conduction, convection, radiation) for a small time step, calculate the resulting change in temperature, and then go through the next time step using the new temperatures. For many people, this is probably a fuzzy concept and, unfortunately, I can’t think of an easy analogy that will crystallize it. But what it means in simple terms is that each heat transfer mechanism works independently, but each affects the other mechanisms via the temperature change (if I come up with a useful analogy or example, I will post it as a comment). And likewise the more complex equation of radiative transfer (see Theory and Experiment – Atmospheric Radiation) will also rely on the temperature profile established from convection. So – an ocean surface with an emissivity of 0.99 and a surface temperature of 15°C will still radiate 386 W/m², regardless of whether the convection + latent heat term = zero or 10 W/m² or 100 W/m² or 500 W/m². This is a common claim. It’s simple to demonstrate that the claim is not true. Let’s take a look at a few atmospheric physics text books. 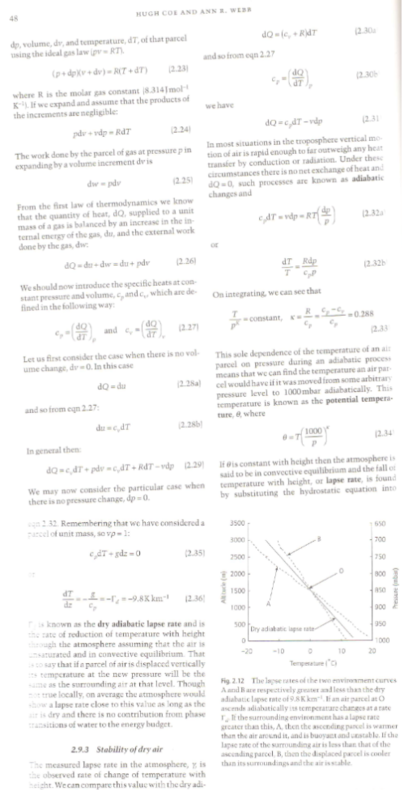 In fact, you will find some kind of derivation like this in almost every atmospheric physics textbook. Both convection and radiation are important in heat transfer in the troposphere. The surface of the earth does not cool primarily by infrared radiation. It cools mainly through evaporation. Most of the evaporated moisture ends up in convective clouds.. where the moisture condenses into rain.. Note the important point that convection acts to reduce the surface temperature. If radiation was the dominant mechanism for heat transfer the surface temperature would be much higher. Convection lowers the surface temperature. However, it only acts to reduce the effect of the inappropriately-named “greenhouse” gases. And convection can’t move heat into space, only radiation can do that, which is why radiation is extremely important. The idea that climate science ignores or misunderstands convection is a myth. This is something you can easily demonstrate for yourself by checking the articles that claim it. Do they cite atmospheric physics textbooks? Do they cite formative papers that explained the temperature profile in the lower atmosphere? Perhaps in a later article I might explain this in more detail. It is already covered to some extent in On Missing the Point by Chilingar et al (2008). As a sample of the basic misunderstanding involved in this claim, take a look at Politics and the Greenhouse Effect by Hans Jelbring, which includes a section Atmospheric Temperature Distribution in a Gravitational Field by William C. Gilbert. 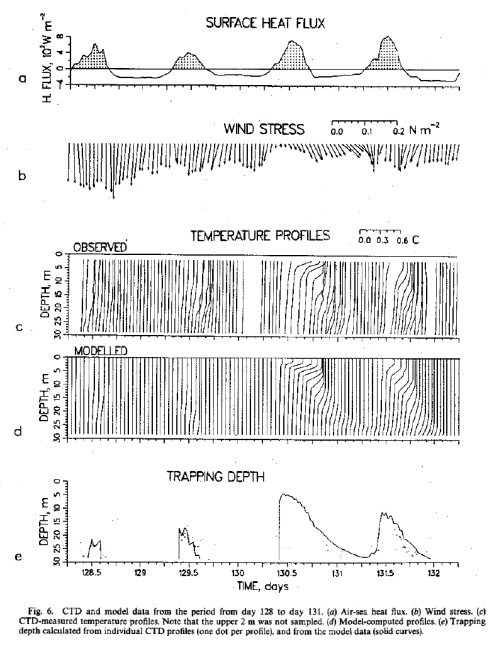 If you read the first section by Jelbring (ignoring the snipes) it is nothing different from what you find in an atmospheric physics textbook. 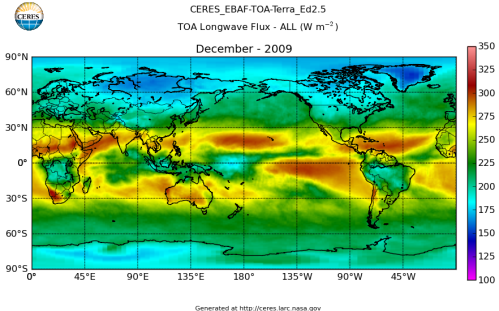 No one in atmospheric physics disputes the adiabatic lapse rate, or its derivation, or its total lack of dependence on radiation. T is proportional to P and P is known from observation to decrease with increasing altitude. It follows that the average T has to decrease with altitude. This decrease from the surface to the average infrared emission altitude around 4000 m is 33 oC. It will be about the same even if we increase greenhouse gases by 100%. – was very incomplete. How is it possible not to know the most important point about the inappropriately-named “greenhouse” effect with a PhD in Climatology? Or even no PhD and just a slight interest in the field? What determines the average emission altitude? The “opacity” of the atmosphere. See The Earth’s Energy Budget – Part Three. Clearly Jelbring doesn’t know about it, otherwise he would have brought it up – and explained his theory of how doubling CO2 doesn’t change the opacity of the atmosphere – or the average altitude of radiative cooling to space. I was immediately amazed at the paltry level of scientific competence that I found, especially in the basic areas of heat and mass transfer. Even the relatively simple analysis of atmospheric temperature distributions were misunderstood completely. Where is Gilbert’s evidence for his amazing claim? It is remarkable that this very simple derivation is totally ignored in the field of Climate Science simply because it refutes the radiation heat transfer model as the dominant cause of the GE. Hence, that community is relying on an inadequate model to blame CO2 and innocent citizens for global warming in order to generate funding and to gain attention. If this is what“science” has become today, I, as a scientist, am ashamed. I’m amazed. Hopefully, everyone reading this article is amazed. The derivation of the lapse rate is in every single atmospheric physics textbook. And no one believes that radiative heat transfer determines the lapse rate. And the important point – the Climate Science 101 point – is that the altitude of the radiative cooling to space is affected by the concentration of “greenhouse” gases. Actually understanding a subject is a pre-requisite for “debunking” it. Many people read blog articles and comments on blog articles and then repeat them elsewhere. That doesn’t make them true. Science is about what can be tested. What would be a worthwhile “debunking” is for someone to take a well-established atmospheric physics textbook and point out all the mistakes. If they can find any. It would be more valuable than just “making stuff up”. In Part One we looked at the absorption of solar and atmospheric radiation (aka “back radiation”) in the ocean. About half of the solar energy is absorbed in the first meter, but most of the DLR (downward longwave radiation), or “back radiation”, from the atmosphere is absorbed in the first few microns of the ocean surface. And all of the DLR is absorbed in the first 0.1mm of the ocean. Warmer water is less dense (more buoyant) than cooler water. Less dense water rises to the top over more dense water and so a surface being heated at the very top is “stratified”. This really means that there is no tendency for water from below to displace water above. How then can heat from the top layer of the atmosphere make it into the ocean? In Part Two we looked first at what would happen if the “back radiation” was absorbed and immediately consumed in the process of evaporation. The ocean would be much colder. Then we looked at simple models of heating from solar radiation and DLR if there was no convection (within the ocean). Because the conductivity of water is quite low the results are strange – the water boils around 1m down. Of course, this doesn’t happen – the water heats up, expands and rises. This is “natural convection”. The article touched on this and also on “forced convection” via the effects of the wind “stirring” the water. The ocean is a fascinating place, very complex, but of course the basics of heat transfer still stay the same. How Does Heat Move Through the Ocean? There are competing forces, as you might expect in a dynamic system. Huge amounts of energy also move from the equator to the poles, approximately 50:50 via the ocean and the atmosphere. To consider the complete picture of the energy transfer – the atmosphere also radiates to the ocean (see The Amazing Case of “Back Radiation” -Part One and the following parts). The issue that was probably implied in the original question was “if back radiation increases due to more CO2 (or other trace gas increases) will that energy be mixed into the ocean?”. If we “dive in” to a little more detail, as in Part Two, then we see that solar radiation is absorbed in the top few meters of the ocean and as a consequence, this ocean heat rises to the surface. In this article we will try to understand more about how the upper layer of the ocean mixes. There is a huge wealth of experimental results in ocean “heat budgets” and temperature profiles. 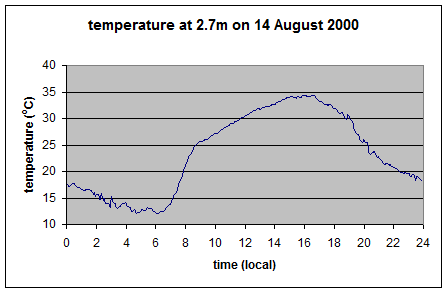 With these temperature profiles we also see the effect of the day-night variation. Regardless of wind speed, at night the temperature profile shows that the ocean has become well mixed. 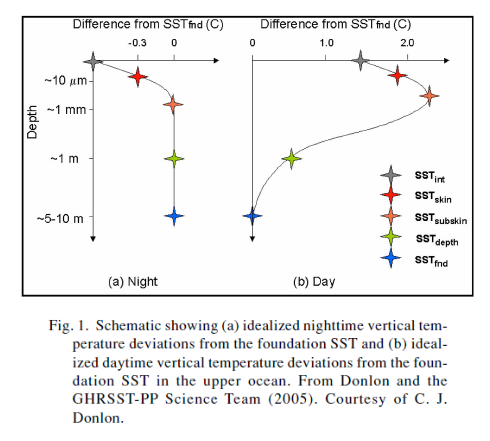 The variation in surface temperature (SST) from day to night indicates the same effect taking place. During light winds in tropical waters very large temperature variations can be seen (up to 2-3°C and even 5°C), whereas more generally the SST diurnal variation is less than 0.5°C. The SST measurements were done by the HCMR (Heat Capacity Mapping Radiometer) and the study area is East of Sardinia in the Mediterranean. At night the surface of the ocean cools rapidly via radiation – but is not receiving any heat via solar radiation. Therefore, the top surface of the ocean cools – and so it sinks. Therefore, every night, the ocean heat in the top few meters becomes very well mixed. During the day (and the night), when the wind picks up over the surface two effects take place. One is that the top few meters of the ocean become well-mixed due to wind-induced stirring. The other effect is that the surface cools more rapidly than normal due to convective cooling (convective heat transfer to the atmosphere), and therefore is more likely to sink. Let’s not pretend this paper was anything other than what it obviously appears to be.. The aim of this article is just to show some field research about how the top layer of the ocean mixes. 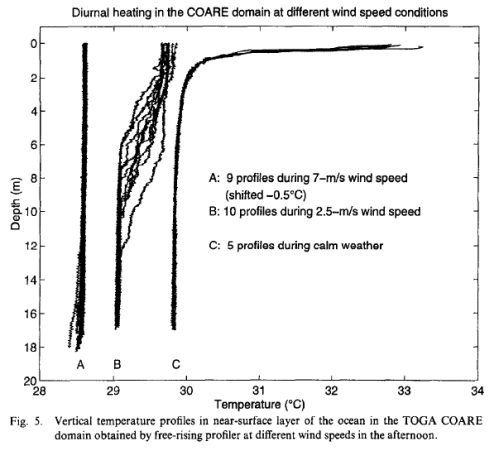 Wind and diurnal cooling mix heat from the surface into the top few meters of the ocean. In the next article we will analyze the possible effect of a little more “back radiation” in the light of these results. Some people get upset if we use the term heat, and object that heat is the net of the two way process of energy exchange. It’s not too important for most of us. I only mention it to make it clear that if the colder atmosphere transfers energy to the ocean then more energy goes in the reverse direction. It is a dull point. Do Trenberth and Kiehl understand the First Law of Thermodynamics? Part Three and a Half – The Creation of Energy? I’m in the process of writing a couple more in-depth articles but have been much distracted by “First Life” in recent weeks.. sad and unfortunate, because writing Science of Doom articles is much more interesting.. While writing a new article – What’s the Palaver? – Kiehl and Trenberth 1997 – I thought that I should separately explain a few things which related to the earlier article: Do Trenberth and Kiehl understand the First Law of Thermodynamics? Part Three. I know that many readers already get the point. But clearly some people find the model – and real life – so controversial that they will find many ways to claim “real life” wrong. Stefan-Boltzmann, who was he? Pyrgeometers– clearly a fake product that should be investigated by the Justice Department? And so on. One of the problems is that radiant heat transfer is not something in accord with everyday life and so – as we all do – people draw on their own experience. But people also draw on confused ideas about the First Law of Thermodynamics to make their case. In this article, two ideas. First, is the Atmosphere Made of PVC? In the original article – Do Trenberth and Kiehl understand the First Law of Thermodynamics? – I used a simple heat conduction problem to demonstrate that temperatures can be much higher inside a system than outside a system, when the system is heated from within. One commenter explained the link between this and the atmosphere, although perhaps my attempts at humor had slightly back-fired. I had disclaimed any relationship between PVC spheres and the atmosphere..
Well, I confirm the atmosphere is not made of PVC, and that conduction is not important for heat transfer through the atmosphere. But there is relevance for the atmosphere. Where is the relevance? Solar radiation heats the climate system “from within”. The atmosphere is mostly transparent to solar radiation so the solar energy initially heats the surface of the earth. Then the surface of the earth heats the atmosphere. Finally the atmosphere radiates energy back out to space. If it were true that the first law of thermodynamics – the conservation of energy – was violated by a simple “lagged pipe” model – well, that would be the end of an important branch of thermodynamics. The model showed that the temperature of an inner surface can be higher than an outer surface – and, therefore, radiation from an inner surfaces can be higher than the radiation to space from the outer surface. The reason for providing the model of the PVC sphere – much simpler than the atmosphere – was to demonstrate that simple point. Many people write entertainingly inaccurate articles about this subject (see Interesting Refutation of Some Basics for one example). Apparently, if the radiation from the atmosphere/surface into space is 239 W/m² then the radiation from the inner surface itself cannot be more than 239 W/m². A confusion about the First Law of Thermodynamics. To be specific, the actual claim from the believers in the Imaginary First Law of Thermodynamics (IFTL) is that the total radiation from the earth’s surface cannot be higher than the total radiation from the climate system into space. This, according to the IFLT, is not allowed. Let’s consider the consequences and calculate the results. All we need to connect the two values – when we have the W/m² for both surfaces – is the ratio of surface areas. In the case of the Earth and climate system, the radius of the earth and the radius of the “climate system” are almost identical.. The radius of the earth, r1 = 6,380 km or 6.38 x 106 m.
The radiation to space takes place from an average height of around 6km from the surface, so the radius of “the climate system”, r2 = 6.39 x 106 m (at most). The total radiation to space, E2 = 239 W/m² (measured by satellite). Unsurprisingly, this surface radiation value is almost the same as the radiation into space because the two areas are almost identical. The “currently believed” average value from the earth’s surface is 396 W/m². This is due to the emissivity of the earth’s surface being very close to 1. The surface temperature has been massively over-estimated and the “average” temperature of the earth’s surface is actually around -18°C (see note 1). The 3rd choice should not be ruled out. Perhaps Antartica is a lot larger than measured, or a lot colder. How many temperature stations are there on Antarctica anyway? Maybe there is some cartographical error in estimating the area of this continent from when planes have flown over Antarctica and satellites have crossed the poles. Perhaps the Gobi desert is a lot colder than people think. No one really makes an effort to measure this stuff, climate scientists just take it all for granted, sitting in their nice warm comfortable offices looking over the results of supercomputer climate models. No one does any field research. Quite plausible really. It’s not too hard to make the case that the average temperature of the earth is much much much colder than is generally claimed. Let’s review the very simple hollow PVC sphere model. In the original article, the inner radius was 10m and the outer radius was 13m. Let’s look at what happens as the inner radius is increased up to 10,000m while the wall thickness stays at 3m. Instead of keeping the internal energy source of 30,000W constant, we will keep the internal energy source per unit area of inner surface constant. In the original example, this value was 23.9 W/m². Note that the x-axis is a log scale. The initial value, 10¹ (=10) was the value from the original example, and the temperature difference was 290K. As the sphere becomes much larger (and the wall thickness stays constant) the temperature difference tends towards 377K. Now that is a very interesting number that we can check. So this is a very simple test. There is no other way to link heat conduction and temperature difference. The simple equations that anyone can check support the PVC sphere model results. Let’s find out what happens under the imaginary first law. It will be quite surprising for the supporters of the theory. 3. Therefore, we can calculate the outer surface temperature and therefore the temperature difference. Note the important point that as the radius increases the temperature difference reduces to almost nothing – this is the inevitable consequence of the (flawed) argument that inner surface radiation has to equal outer surface radiation. Because when r1=10,000m, r2=10,003m, therefore, the areas are almost identical. Therefore, the radiation values are almost identical, therefore the temperatures are almost identical. Ouch. This means that somehow 23.9 W/m² is driven by heat conduction across 3m of PVC with no temperature difference. How can this happen? Well – it can’t. 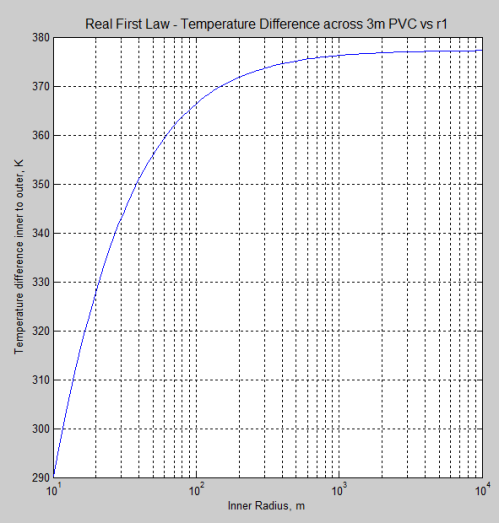 To get 23.9 W/m² across a planar PVC wall 3m thick requires a temperature difference of 377 K.
When r1 = 10,000 m, ΔT = 0.02 K according to my IFTL calculations – and so the conducted heat per unit area, q = 0.0013 W/m². The heat can’t get out, which means the temperature inside increases.. and keeps increasing until the temperature differential is high enough to drive 23.9 W/m² though the wall. Hopefully, this makes it clear to anyone who hasn’t already made a total nana of themselves that the imaginary first law of thermodynamics, is .. imaginary. Note 1 – The concept of an average temperature is not really needed to actually do this calculation. Averaging temperatures across different surface materials like oceans, rocks, deserts clearly has some problems – see for example, Why Global Mean Surface Temperature Should be Relegated, Or Mostly Ignored. All that is really required is to calculate the average radiation value instead. Just find the temperature at each location and calculate the emitted radiation. Then average up all the numbers (area-weighted). As a note to the note.. To get 240 W/m² with an emissivity close to 1, the “average temperature” can be at most -18°C. With a wider day/night and seasonal variation than we actually experience on earth the “average temperature” would then be lower than -18°C.